Although the communication styles of kangaroos are rather shrouded in mystery, what is certain is that these marsupials do indeed convey messages to each other and also to outsiders when necessary. Whether through loud foot stomping or protective growling, these pouched Australian creatures definitely know how to get their points across. One of the most common ways kangaroos communicate is by stomping their hind legs noisily on the ground. If a kangaroo thumps his feet aggressively, then he's actually trying to help out fellow roos in his vicinity, alerting them to danger, such as an approaching predator like a wild dog or dingo. Aside from just foot stomping, kangaroos also often alert others to threats by making high-pitched barking noises. 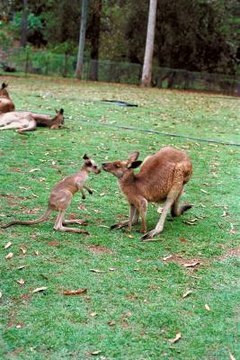 If a male kangaroo -- or "buck" -- encounters another male that he feels is higher up in status, he may produce a coughing or guttural grumbling sound to express obedience and submissiveness. If a kangaroo does this, he's not looking for a fight, but rather for peace. Male kangaroos frequently battle it out with each other physically in attempts to elevate their mob positioning. Whoever wins usually gains access to females for mating purposes. "Mob" is a term to describe kangaroo group units, as these animals are highly companionable. Female kangaroos, which are referred to as "does," generally "speak" to their wee joeys by producing distinct clucking or clicking noises, usually several times in a row. If a doe needs her youngsters to come over to her for whatever reason, expect to hear some clucking or clicking action. If a kangaroo feels in any way frightened or threatened by someone or something, he may react by making a growling sound similar to a canine. When a kangaroo growls, it's a sign for the offending party to back off -- and back off immediately. If the "growlee" doesn't go away, the kangaroo may just physically attack -- yikes. During aggressive altercations with others, kangaroos also often produce piercing "screaming" sounds.